It is my pleasure to introduce you to one of the authors featured in my Christmas Giveaway (see my Events page for details on how to enter). Kate Robbins writes historical romance novels out of pure escapism and a love for all things Scottish, not to mention a life-long enjoyment of reading romance. Her journey into storytelling began with a short screenplay she wrote, directed, and produced which was screened at the 2003 Nickel Film Festival in St. John’s, Newfoundland. She has also written and directed several stage plays for youth. Kate loves the research process and delving into secondary sources in order to give readers the most authentic historical romance possible. She has travelled to Scotland and has visited the sites described in her Highland Chiefs series. Bound to the Highlander is the first of three books set during the early fifteenth century during the reign of James Stewart, first of his name. 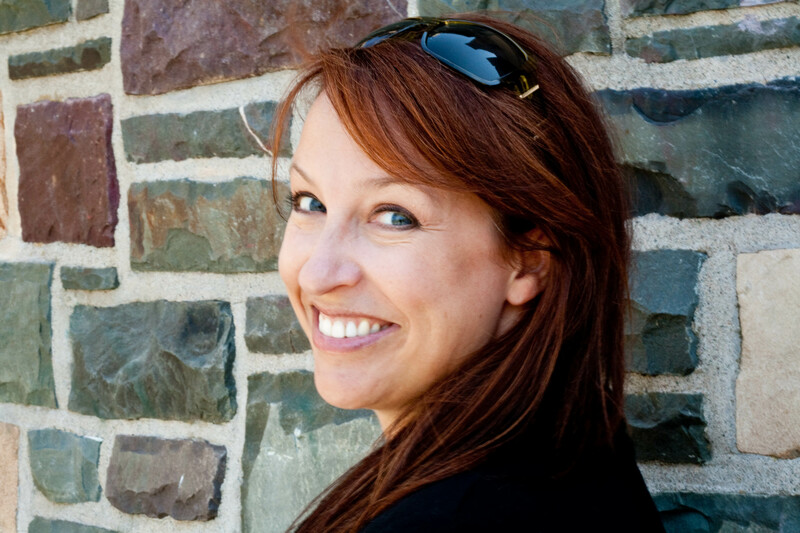 Kate is the pen name of Debbie Robbins who lives in St. John’s, Newfoundland, Canada with her hubby, the man-beast, and her two awesome boys, the man-cubs. KR: My debut novel, Bound to the Highlander (BTTH), was released on October 10th of this year and I’ve been flabbergasted by the response so far. I’m so blessed by the wonderful support I’ve received from friends and family and by complete strangers who have embraced the first in my Highland Chiefs series. Note from Ceci – I loved it! KR: The second book in my Highland Chiefs series, Promised to the Highlander (PTTH), is currently under consideration with my publisher. This book focuses on Fergus MacKay and the love story between him and the forbidden Nessia Stephenson. Why is she forbidden? Because she’s betrothed to his brother, William—and Fergus arranged it. And I gotta share this. I discovered Fergus while writing BTTH and have been totally smitten with him ever since. I actually went through a short mourning period when I finished PTTH just because I wouldn’t be able to spend time with him (in my head) anymore. Crazee or what? Ceci: I totally understand this and I expect other authors do too. KR: I had a lot of input on BTTH’s cover. And my publisher totally delivered. I’m so happy with it and cannot wait to see how the others in the series look alongside it. The brooch pin was the grand prize in my blog tour giveaway back in Oct/November. It has the MacIntosh clan crest along with red stones representing the clan tartan. I also have pins to match the chiefs of the next two books—MacKay and Sutherland. KR: I have many favourite authors including Johanna Lindsay, Stephen King, Julianne MacLean, Julie Garwood, Jose Saramago, and on and on and on. I’m an avid reader and so love far too many to mention. On to a few just for fun questions. If you could instantly transport yourself to anywhere in the world right now where would you go and why? KR: Scotland baby yeah! Haggis. Kilts. Scotch. Beautiful people. Stunning landscape. Kilts. Amazing history. Kilts. Sticky toffee pudding. Edinburgh. Glenshiel. Blaquidder. Kilts. Angus beef. Smoked salmon. And did I mention kilts? Seriously my two trips there exceeded my passion for the place. I’d move there in a heartbeat. KR: Edinburgh. Anyone who enjoys reading Scottish historicals really should endeavor to travel to Scotland if you’ve not done so already. There are so many recommendations I have for all over, but in Edinburgh in particular, just one day on the Royal Mile and you’d be hooked. Wanna go? Ceci: You don’t need to twist my arm, I’m ready to pack! KR: Nachos. Seriously what’s not to love about nachos? You have your dairy (cheese), grains (nachos), vegetables (green onion, peppers), and meat (beef or chicken). Come on. It’s like the perfect meal right? And if you get bored you can totally mix it up. I’ve even had something called Irish nachos that have thinly sliced potatoes fried up and then topped with cheese and bacon and green onion. Never a dull day with nachos around, no siree. KR: Chapters Indigo. Hands down. By the time I browse all the book sale tables and then head over to the journal and office supply section I could easily spend that and more. I have a journal addiction. I’ve tried to curb it, but my efforts are not working. Help! To make matters worse, they’ve gone and added all this house stuff that I never use but end up buying because it looks cool. Yeah I bought whisky rocks. I don’t put ice in my whisky! But by God I had to have those rocks. KR: Getting published. That was a huge deal for me. Huge! I had to learn all the rules from scratch. But it was either that or go cracked because my characters would not let me rest. KR: I’d like to see all three books in the Highland Chiefs series out there (potential for five), at least two from another Scottish series I’m currently researching (sixteenth century), and one from a Viking/Scottish series I just started thinking about (eleventh century). I guess I had better get crackin’. Ceci: I’m right there with you. There are lots of stories waiting to be written. KR: I’m fascinated with Scottish history and love talking about it. So if you have a question, or want to chat about it, please pop me a message. I took some historical liberties with this series to make the story flow in the way it does so if you’re curious about why I portrayed certain things in certain ways I’d love to hear from you. I’ve gotten some tremendous feedback so far and I absolutely love hearing from readers. So yeah, ask me anything! Aileana Chattan suffers a devastating loss, then discovers she is to wed neighbouring chief and baron, James MacIntosh—a man she despises and whose loyalty deprived her of the father she loved. Despite him and his traitorous clan, Aileana will do her duty, but she doesn’t have to like it or him. But when the MacIntosh awakens something inside her so absolute and consuming, she is forced to question everything. James MacIntosh is a nobleman torn between tradition and progress. He must make a sacrifice if he is to help Scotland move forward as a unified country. Forced to sign a marriage contract years earlier binding Lady Aileana to him, James must find a way to break it, or risk losing all—including his heart. From the wild and rugged Highlands near Inverness to the dungeons of Edinburgh Castle, James and Aileana’s preconceptions of honour, duty and love are challenged at every adventurous turn. The early morning mist was refreshing as she walked along the well-beaten road leading north toward Inverness. The fog lifted just enough to expose the stunning landscape. Out here, with the rolling green hills and explosions of colour, she could spread her arms wide and feel free from the pain gripping her. The tightness in her chest eased. In the distance, the sharp mountain peaks protruded from the crawling mist towards the blue sky. The day would be lovely when the fog burned off. Aileana reached the crossroads and turned right, following a smaller path leading east. Thick brush and oak trees framed the path, often giving way to vast farmlands that lay beyond. Littered here and there were bluebells, lady fingers, and cowslip. She knelt to collect some, pausing to inhale their sweet scent. The flowers brought back memories of the many times her uncle had brought them to her. Widowed and with no children of his own, he took guardianship of Aileana after her father’s death and came to love and treat her as if she were his own. All these years, they had only each other and she was lost without him. Her hair prickled at her nape. She stepped onto the road and looked both ways, her arms full of flowers. The thunder of hooves reached her ears at about the same time her peripheral vision caught a flash of something white and very large coming around the bend just ahead. She leapt out of the way to avoid being trampled, landing on her backside. She strained her neck and viewed the largest horse she’d ever seen. The dense fog had prevented her from seeing the horse or its rider approaching at top speed. She was lucky to have avoided serious injury. Aileana’s heart raced. She should have known better than to walk alone, considering all the recent raids. Was the rider friend or foe? She recognized a small path across the road. If she could get around the giant beast before the rider saw her, she could slip through the trees undetected. Within a split second, however, the rider dismounted and held out his large hand. His deep chuckle made her cheeks burn. The tall man took in her appearance, his sweeping glance resting on the embroidered stitching of her low neckline. His gaze lingered there before travelling up her throat. She held her breath as his eyes trailed over her body. “You can ride with me if you like.” His husky voice conjured images of silk sweeping across her flesh. She was entranced by the sight of him. Thick muscles flexed beneath a dark leather jerkin which ended just above his knee and was secured at his waist with a broad belt. In his current position, she could see his thigh muscle tense and her face grew hotter. His plaid covered one shoulder and ran underneath his sword arm secured by a large silver brooch offset with rubies and centered with a wildcat. MacIntosh. They supported the king. It wasn’t well known, but Uncle had speculated to those he trusted. Anyone who supported a man who pawned his people like cattle for his personal gain was no friend of hers. It was clear from his inappropriate suggestion, she was better off not knowing him. He was no gentleman, despite his expensive accessory and giant horse. No decent man would speak that way to a lady. Couldn’t he tell by the way she was dressed that she was no common wench? Then again, it would not matter to this base sort of man. Either way, without a chaperone, she was not about to remain in his company for one more second. His hand hung in mid-air, but she ignored it, hoisting herself instead off the cold ground. She mustered the most authoritative voice she could. “No thank you.” Aileana lifted her chin and walked away. Aileana turned on her heel intent to put this rogue in his place and ran into his chest. She gasped. The thick, rich scent of leather enveloped her, sending an unexpected shiver down her spine. She stumbled, but he was quick enough to catch her by the arms before she fell. Her hands splayed flat against his chest. Bulging muscles underneath his jerkin begged her fingers to stroke their curve. His bright green eyes bore into hers. While his long brown hair was tied at his nape, a few strands had broken free and fell loose across his face. She fought the irresistible urge to reach up and tuck them behind his ear. His raspy voice made her skin tingle. Aileana pushed against his chest. He pushed back. The stranger pulled her forward, his mouth now no more than an inch from hers. His hard body pressed against hers, spreading heat to her very core. His fingers brushed the side of her mouth and his lips parted. Her knees trembled. His intent was clear and their proximity was inappropriate. Thanks Ann. You are a truly great fan! 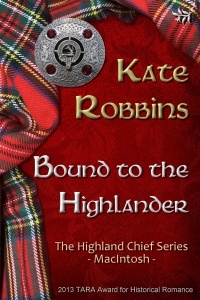 I think you will enjoy Bound to the Highlander. I’m really liking this Christmas Giveaway you’re doing, Ceci! I’m finding new to me authors that I desperately want to try. 🙂 Bound To The Highlander just went on my wishlist. So glad to hear that! The books that I am including are written by established authors who have helped promote Highland Solution. Or they are written by newer authors, like me, who I want to promote a bit as well. The only exception is Demon Laird. I didn’t meet Kathryn Loch until after I read her book but I LOVED it. She has graciously agreed to be a guest here on Thursday. Good luck in the drawing Leah! Hi, Kate and Ceci! Kate you are another new author for me. I really enjoyed the excerpt of BOUND TO THE HIGHLANDER. It sounds like a must read. Merry Christmas and Happy New Year! I am really glad to hear you say that! Most of the books I included in the giveaway are written by authors who publish themselves, or are published by relatively small presses! I was hoping to pay back some kindnesses and give us all a bit of exposure–call it, cross-pollination 😉 I really think you will enjoy the books offered. Good luck! Hi Kate, I have both your tales on my ‘ever growing’ wish list on Amazon and am looking forward to reading them!